Families gather at the Community Market for children’s games during the annual GetDowntown event. Thomas Jefferson declared Lynchburg to be “a most interesting spot,” and it is just as true today as it was in his time. 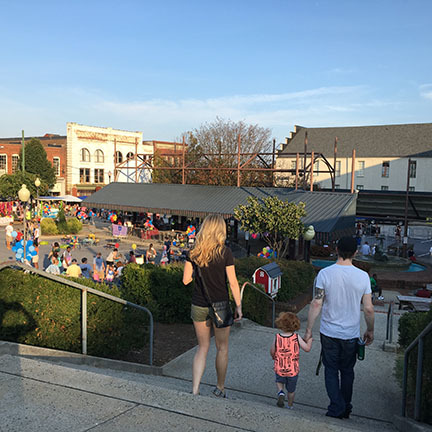 Lynchburg is a very special place to live, offering a quality of life that is a source of pride and enjoyment to its citizens. 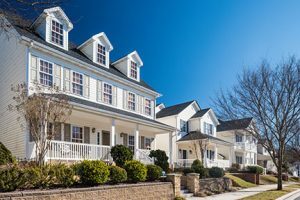 Housing options range from two-days-old to 200-years-old. Lynchburg is an old city (founded in 1786) with a rich historic past; yet it is a growing, vibrant, and forward-looking city abounding in economic opportunity and diversity. Lynchburg is the commercial, cultural, entertainment and retail hub of the Region. The city is one of the Milken Institute’s 2017 “Best Performing Cities,” an index that ranks U. S. metropolitan areas by how well they are creating and sustaining jobs and economic growth. Strategically located in the foothills of the Blue Ridge Mountains along the banks of the James River, Lynchburg is surrounded with natural beauty. Known as the City of Seven Hills, Lynchburg was originally built on College, Garland, Daniel’s, Federal, Diamond, White Rock, and Franklin hills. Lynchburg currently has ten recognized historic districts, and 40 buildings are individually listed on the National Register of Historic Places. Lynchburg is often called the City of Churches because of the large number of churches that are located here. Thomas Road Baptist Church is the largest with a membership of 24,000. All other Protestant denominations are represented as well as Roman Catholic, Green Orthodox, Temple Agudath Sholom, the Unitarian Universalist, and non-denominational churches. MSN.com has listed Lynchburg among “18 American Towns Every Old House Lover Should See,” citing its “many architectural marvels,” including Queen Anne, Greek Revival, Federal, Second Empire and Colonial Revival architecture from as far back as the 1790s. An ongoing preservation effort has kept historic structures safe. The Academy Center for the Arts, Point of Honor, Miller-Claytor House, Quaker Meeting House, Old Lynchburg Courthouse, Carter Glass House, and the Anne Spencer House are just a few of the historic buildings and homes that have been preserved. Quaker Meeting House, the oldest church building in the city, was built in 1798 on land donated by the Lynch family and today is located on the grounds of Quaker Memorial Presbyterian Church. John Lynch, the city’s founder, is buried on the grounds. 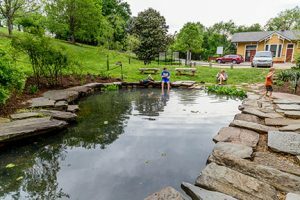 Established in 1806, the Old City Cemetery is an extraordinary 27-acre public garden, “history park,” and wedding venue located in the heart of Lynchburg. 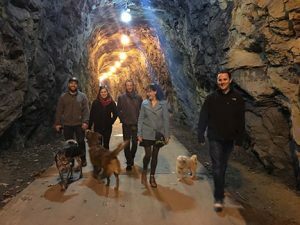 Despite being an active place of burial and remembrance, it is one of the busiest and most popular attractions in the City, hosting more than 33,000 visitors annually. The cemetery is a Virginia Historic Landmark on the National Register of Historic Places. The cemetery is an arboretum of historic plants with specimens including more than 200 antique roses. 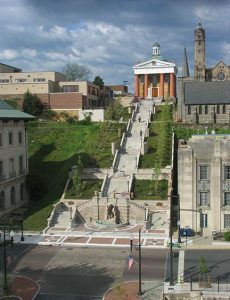 Monument Terrace in downtown Lynchburg is a lasting memorial to Lynchburg’s war dead and was fashioned after the terrace steps of France and Italy. The statue of a World War I doughboy stands at the foot of its 135 steps that lead upward to the Old Courthouse. Lynchburg is a center of education with a tradition of outstanding public education. Nineteen public schools comprise one of the top school systems in the Commonwealth. Ten private schools provide excellent programs. The city is home to five public/private colleges and universities. The city’s downtown revitalization project is making significant changes to the area. Hundreds of new loft apartments have been created through adaptive reuse of historic warehouses and mills, numerous new businesses have opened, and population has increased substantially. With new restaurants, coffee houses, and boutique businesses, Downtown is becoming one of the trendiest and most desirable areas to live and visit. The arts thrive here with outstanding theater, music, and art, thanks in part to local colleges, universities, and high schools. The Blackwater Creek trail passes through an old railroad tunnel. Variety is the keystone of recreation and sports in the Lynchburg area. The city operates 12 parks, 24 playgrounds, eight community centers, an Olympic-size pool, 34 tennis courts, and 26 baseball diamonds. Among the public parks are Blackwater Trail Athletic Area, Miller Park, Peaks View, and Riverside parks. Other recreational opportunities include golfing at public and private courses, hiking in the Blue Ridge Mountains or on the Appalachian Trail; skiing and snowboarding at Liberty University’s Snowflex Center; walking or running on the city’s numerous trails; or attending a minor-league baseball game.